A cycling holiday that uncovers the scenic beauty and cultural highlights of Burma. Get off the beaten track and closer to the wonderfully friendly local people with bike rides between Mandalay, stilt villages of Inle Lake and the temple-studded plains of ancient Bagan. We also cruise the mighty Irrawaddy River. Arriving in Rangoon today we have a chance to relax and freshen up before enjoying a late afternoon visit to the magnificent Shwedagon Pagoda, the most revered Buddhist temple in Burma. Towering some 99 metres over the city, the pagoda's impressive golden stupa dominates the city skyline to the west of Kandawgyi Lake, making it the ideal spot from which to watch the sunset. Originally believed to be over 2,500 years old, this is the oldest pagoda in Burma and certainly one of the most beautiful in the whole of Asia. This visit could be postponed to day 13 if needed. A morning flight to Heho, followed by a drive to Nyaung Shwe, brings us to the beautiful setting of Inle Lake, one of the highest lakes in the country. Devout Buddhists, the local population live in simple stilted houses, fishing in the lake and growing their food on floating gardens of grass and seaweed. Heading out in a boat later today, we have a chance to witness some of the lake's famous 'one-legged' fishermen at work, as well as paying a visit to Phaungdaw U Pagoda. After allowing time for bike fitting and once you are comfortable with your bike for the holiday we start our first ride - around the eastern side of Inle Lake to the village of Nanpan. The ride is pretty flat with some small undulations and along the way there will be views of the lake, villages and surrounding hills. After some free time in Nanpan we make our way back to Nyaung Shwe and the hotel by long tail boats. The rest of the afternoon is left free to either relax, explore Nyaung Shwe or there is even to option to do some local wine tasting. Our total cycling distance today is approximately 40 kilometres (200 metres total accumulated ascent and 200 metres descent). Today's cycle ride takes us on an undulating route around the lake to the Shwe Indein Pagoda followed by an uphill push to Aung Ban village. We plan to make a stop to visit to visit the pagoda complex built above Indein village, comprising of around one thousand stupas of varying sizes, built in the 17th and 18th centuries. We then cycle mostly uphill to Aung Ban where the ride ends and we stop for a well deserved lunch. Afterwards we will drive to Kalaw, set high on the western edge of the Shan Plateau. Popular with the British during their time in Burma, Kalaw still retains a little something of its colonial charm. This afternoon, time permitting, we then have a chance to continue exploring the town by bike. Attractions include the gold lacquered bamboo Buddha of Nee Paya and the Catholic church of Christ the King. Our total cycling distance today is approximately 60 kilometres (870 metres total accumulated ascent and 470 metres descent). Following breakfast this morning we head north, leaving the main road to take a vehicle-less track, cycling off road through a lovely rural landscape of farmland and pretty villages. This first section is challenging with most of today's climbing but the views are stunning. After rejoining the road we cycle through a rolling countryside of rice fields and vegetable gardens, accompanied by ox carts full of cabbages and open top vehicles being taken to market by Pao and Danu villagers. After lunch we have one more ascent as we approach Pindaya, a small pretty lakeside town, which sits beneath a limestone landscape dotted with cave shrines and stupas. Before checking in to our hotel we plan to visit the famed Pindaya Caves, a revered pilgrimage site that is home to some 8,000 images of the Lord Buddha. Extending into the limestone hills above the town, the chambers are filled with a rich assortment of iconography that dates back to the middle years of the 18th century. Our total cycling distance today is approximately 39 kilometres (510 metres total accumulated ascent and 550 metres descent). We start the day with a drive through a patchwork of green countryside and mountain scenery to Kyone where we commence our ride. We plan to cycle along quiet back roads for the first three hours today, on a road rarely used by travellers, starting with a 5km ascent. We make our way towards the village of Myaing on undulating terrain with some sharp ascents and descents where we end today's beautiful ride through the Shan highlands with another 5 km climb. There is a 1 hour drive to Saim Yaung where we stop for lunch. Continuing on this afternoon we complete the remaining 130km by bus arriving into Mandalay in the early evening. Our route passes through spectacular mountain scenery alongside the Zawgwi River, and amongst the variety of produce along the way we will see cotton, turmeric, mangos and teak. Our total cycling distance today is approximately 57 kilometres (700 metres total accumulated ascent and 790 metres descent). Mandalay was Burma's last royal capital and, for many, the centre of its most historic and culturally rich region. Today we explore the countryside around the city, starting first with a ride out to Sagaing, some 20 kilometres away. Overlooking the waters of the Ayeywaddy River, Sagaing is considered one of Burma's most important religious centres and its hillside is covered in pagodas and temples. From the Soon U Ponya Shin Paya atop of Sagaing Hill we will enjoy spectacular views of the river and more than 500 pagodas dotted around the countryside. From here we continue along the river to the ruins of the Mingun Pahtodawgyi which, had it been completed, would have been the world's largest pagoda. We will have time to take a look around the site, before taking a scenic Irrawaddy river boat ride back to Mandalay. Today's ride is generally on the flat. Our total cycling distance today is approximately 37 kilometres (80 metres total accumulated ascent and 50 metres descent). The former royal capital of Amarapura is a short drive south from Mandalay and is perhaps best known for Ubein Bridge - the 1.2 kilometres footbridge that spans Lake Taungthaman. We will have the opportunity to see the bridge from the lake on an optional short boat ride. Returning to Mandalay via the jade market, we then spend this afternoon exploring some of the city's major highlights, including the world's largest book at the Kuthodaw Pagoda, the intricate wooden majesty of the Shwenanda (Golden Palace) Monastery and Mandalay Hill. Our morning starts with a vist to the 17th Century Kuang Madaw Pagoda, which houses the biggest dome in Burma - modelled on the Mahaceti in Sri Lanka. We continue by bus to Chaung U village where we begin the day's cycling. Taking the quiet backroads towards the bustling river hub of Monywa allows us to visit some of the most unique Buddhist structures in Burma. A giant 128-metre tall standing Buddha and a 95-metre long reclining Buddha look out over Bodhi Tataung, a garden of over 1000 sitting Buddhas - all facing the same direction. A little further through the villages we arrive at the bizarre Thanboddhay Paya complex, the result of a monk's dreams and visions which resulted in him designing a stupendous pagoda containing 582,363 Buddha images. We continue our journey by bicycle arriving at our hotel mid-afternoon, in time to relax beside the lake. The ride today is mostly on the flat with one long gentle and gradual ascent and descent. Our total cycling distance today is approximately 33 kilometres (70 metres total accumulated ascent and 70 metres descent). Heading out of Monywa on the bikes, we leave the main road to cycle the back roads towards Pakkoku. Our route takes us along a dusty path through traditional wooden villages, bisecting fields of rice, sesame and peanuts and giving a unique close-up of rural life. Ox carts amble through the villages, some of which conceal impressive frescos inside small temple complexes. Later we rejoin the main road, cross the impressive Chindwin River and cycle to Aung Moe junction, where we end our cycling for today. Later this afternoon we drive to Pakkoku, where we take a local ferry down the Irrawaddy River to the once imperial capital of Bagan, one of the most impressive religious archaeological sites anywhere in Asia. Our total cycling distance today is approximately 55 kilometres (650 metres total accumulated ascent and 625 metres descent). Bagan rose to prominence during the 11th to 13th centuries. At its height it presented a sea of colour and spectacle, with over 13,000 temples and pagodas spread across its expansive plains. Today just over 2,000 remain and we visit some of the most important ones today. We begin our day with the option of enjoying sunrise from the terraces of the stunning 12th century Dhammayazika Temple, which puts the enormity and majesty of this ancient capital into perfect perspective. We will then cycle along flat and sandy tracks between the temples visiting the distinctive Shwezigon and Ananda Pagodas, as well as the 13th century Wetkyi-in-Gubyaukgyi cave temple. After enjoying the wonders of Bagan, the rest of the afternoon is left free for you to relax or explore further, maybe enjoying the sunset from one of the temples or taking an optional late afternoon boat ride on the Irrawaddy River. Our total cycling distance today is approximately 24 kilometres (on the flat). This morning we cycle our final ride across the Bagan plateau out to Mount Popa, Burma's sacred abode of the Nats (spirit gods). A volcanic plug that rises to a height of 1,500 metres above the surrounding landscape. The road steadily inclines the whole way on our ride and we use our vehicles to climb the very steep sections to the base of the mountain. Depending on time available and your energy levels there may be the opportunity to climb on foot the 777 steps that lead to the summit and temple. The summit is covered by rare flora and fauna and is designated a national park as well as boasting some fine panoramic views of the surroundings. The small temple on the summit is also home to troops of wild monkeys. After taking lunch we return to Bagan on bike by way of a local farm producing traditional 'toddy' palm juice. There are various options to return by bike either part of the way or the entire route back to Bagan. The remainder of the day is free in Bagan with the option to see the sun set from a temple. Our total cycling distance today is approximately 49 kilometres (470 metres total accumulated ascent and 30 metres descent). After flying back to Rangoon this morning we enjoy a tour of the city, taking in the ancient relics housed in the unusual (and hollow) Botataung Pagoda before exploring a little of the city's downtown area. A stroll along Pansodan Street takes in the rich colonial architecture and bustling street markets, whilst the immense Bogyoke Market, formerly known as Scott's Market, is filled with handicrafts from all over the country (closed on Mondays, full moons and public holidays). The trip ends in Rangoon this morning after breakfast. Bagan - Traditional massage USD 10; Optional sunrise USD 8. You will need clothes that are comfortable in hot, humid conditions. Sunhat, sunglasses, long trousers and long sleeved shirts are essential for protection from the sun. A buff is useful for sun protection and in case conditions are dusty. Warm weather clothing is suitable for Rangoon, Mandalay and Bagan. The Shan highlands, Inle Lake and Kalaw are cooler and in the winter season temperatures may reach near zero at night. Please dress respectfully when visiting temples and religious sites, covering your torso, shoulders and legs to below the knee. It will be possible to buy a sarong locally if needed. You may want to consider bringing easily removable footwear for convenience as you can only enter sacred sites barefoot. In general, as Burma is a traditional, conservative and largely Buddhist culture we recommend you do not wear revealing clothing. On all Explore cycle holidays we strongly recommend you bring along and wear your cycle helmet. In case of an accident resulting in personal injury, certain insurance policies are invalidated in cases where a helmet was not being worn. Cycle glasses to protect against dust, pollen and the sun, padded cycle gloves and a water bottle or water delivery system (e.g. camelback or platypus) are also useful. Off road sections can be dusty. Buffs are good to protect from dust. You may choose to bring your own gel seat cover for added comfort. If a handle bar bag or pannier is not provided (check bike details) then you may like to bring a small rucksack to wear while cycling, alternatively you can leave things in the support bus and will be able to access sporadically throughout each day. Other items to consider bringing are a sunhat and sun cream, torch, earplugs and insect repellent. Please carry some or all of your cycling equipment e.g. helmet as part of your hand luggage. Mobile phones: Mobile coverage in Burma is improving but be aware that your mobile may not work. It is possible to buy a local SIM card for around USD 4 in order to make/receive international calls, as long as your phone is un-locked. SMS messaging may not be possible. Internet is available in Rangoon and Mandalay though should not be relied upon. Although entirely voluntary, tipping is a recognized part of life in this region of the world. Some local staff will look to members of the group for personal recognition of particular services provided. In order to make things easier for you, the Tour Leaders may organise a group's tips kitty and if this is the case, they will account for it throughout the tour. Accordingly you should allow approximately USD 50 for this purpose. 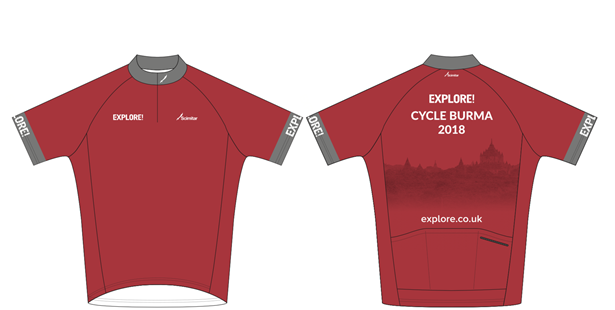 On this tour we cycle 394 km over nine days (an average of 44 km per day). We mostly follow provincial roads with less car traffic (80% on tarmac roads and 20% on earth/ gravel roads). The terrain is generally flat except for the sections around Kalaw, Maymyo, Pindaya and Inle Lake which are in the hills. A support vehicle accompanies the rides throughout the tour. We have graded the route as moderate. 21 gear Cannondale Trail 8 mountain bike with front suspension. Your included bike is a 21 gear Cannondale Trail 8 mountain bike with front suspension and will be the correct frame size for your height. A water bottle holder is included as well as the facility to fit your own pedals or saddle if you wish to bring them. A support vehicle accompanies the rides throughout the trip. We provide spare parts and take care of the day to day maintenance. All you need to bring is your own helmet. Sadly, recent events surrounding the Rohingya minority have seen Burma thrust into the international spotlight again. The areas of unrest are concentrated within the north of Rakhine state, far away from any location our itineraries visit. We actively monitor the situation on the ground and closely follow the advice of the Foreign and Commonwealth Office (FCO). We also remain acutely aware of our ethical responsibility; and in order to ensure that the local communities benefit the most from our trips, we use a privately-owned Burmese local ground agent for all of our local services. Our itineraries have been carefully planned to limit the use of services owned by, or affiliated with, the government. This ensures that the Burmese people benefit as much as possible from our tours. We strongly believe that we contribute positively to the local economy, whilst providing our customers with the privilege of direct and genuine interaction with the local people, as well as an insight into the country's unique culture and heritage.